(HealthDay News) -- When you're caring for a loved one with the flu, it's important to protect yourself from getting sick. Create a sick room to help isolate the sick person. Frequently wash hands with soap and water or alcohol-based hand sanitizer, particularly after contact with the sick person or something the sick person has touched. 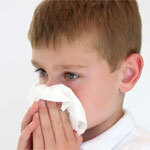 Encourage the sick person to cover the mouth and nose when coughing or sneezing, and to frequently wash hands. Limit caregiving to one person in the home to reduce exposure to other family members. If caring for a sick child, hold the child with the chin on your shoulder so the child doesn't cough into your face. Keep the home ventilated as possible. Keep surfaces disinfected and dispose of any tissues. Wash linens, dishes and eating utensils thoroughly.